Thandai is rich milk based Indian drink. It is most popularly consumed during the Indian festival of colours – Holi. I have been making Thandai syrup/concentrate at home for past couple of years and believe me it is so simple to make it that you would never want to get a bottle of ready-made Thandai syrup. 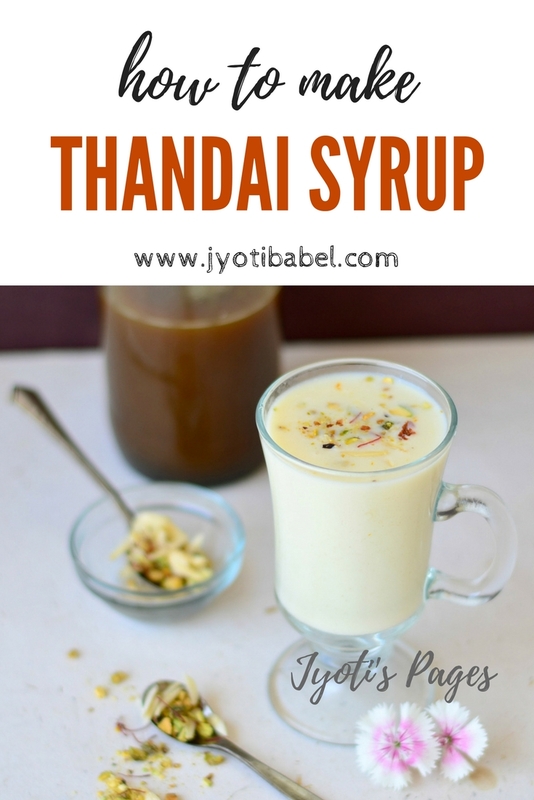 In this post, I am going to tell you how to make Thandai Syrup at home from scratch. It is one of those stellar recipes that I discovered when I started food blogging years ago. I had tried it from here and instantly I fell in love with the recipe. I had even done a blog post on it here and after all these years I think it seems to be lost in the labyrinths of this blog. So, I think it is worth re-posting it. Since I am making it for quite some time now; I have fine-tuned the recipe to my own liking and taste. 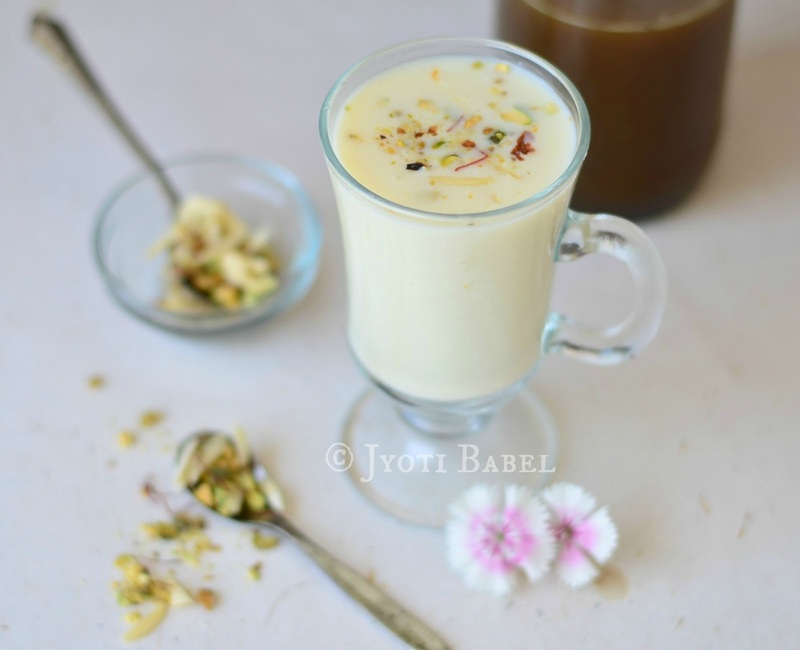 I like to believe that Thandai is a drink fit for the Royals – with almonds, saffron, cardamom, rose water, et al, in the right amounts you cannot go wrong. One glance at the recipe and it may seem to be a daunting one, but is NOT. Read the recipe well; gather all the ingredients at one place before you set out to make it. 1. In a blender jar add the blanched almonds. Drain water from poppy seeds and melon seeds and tip them into the mixer jar and using very little water grind it into a fine paste. Strain through a muslin cloth and extract all the liquid and keep aside. You may add little water to the residue and churn it again in the mixer again and repeat the process of straining again. 2. Add the rose petal spread to the ground cardamom-pepper-fennel mixture and mix well. Strain through a fine plastic net and extract all the liquid and keep aside. It is okay if the extracted liquid has some fine residue. 3. Mix both the extracted liquids and keep aside. 4. Add the sugar and 1 cup of water in a deep thick bottom pan and cook until the sugar dissolves. It may take some time for the sugar to dissolve. Bring it to boil and simmer for a couple of minutes. 5. Remove from the heat and let it cool for a couple of minutes. Add the extracted liquid to it and stir. Heat it again and bring it to a boil and then turn the heat to medium and simmer for 7-10 minutes, stirring constantly. 6. Remove from the heat and cool till warm and then add the rubbed saffron mixture and rose water and mix well.When the Thandai syrup completely cools down, use a funnel to pour into a sterilized bottle. It keeps well for at least 3 months when kept in the refrigerator. 7. To make a glass of Thandai add 2 tbsp syrup and top it with 200 ml chilled milk. Stir vigorously. Garnish with almond slivers, chopped pistachios and saffron strands. 1. Don't be tempted to add more than 1+ 1/4 cup of water to 1 kg sugar, else the final syrup will be very thin. 2. If the syrup crystallizes in the process of cooling, add 1/4 cup of hot water and give it a good stir. 3. If you do not have all the ingredients listed to make thandai, you can try a combination of almonds + cardamom or almonds + kesar to get almond syrup. The process will be same. 4. The residue of almond+poppy seeds+melon seeds can be used in gravies if used on the same day. 5. In order to sterilize a glass bottle with no metal parts on it, place a thoroughly cleaned, washed and dried bottle in microwave and microwave it for 1 minute. Use it to store the Thandai syrup when it comes back to room temperature. 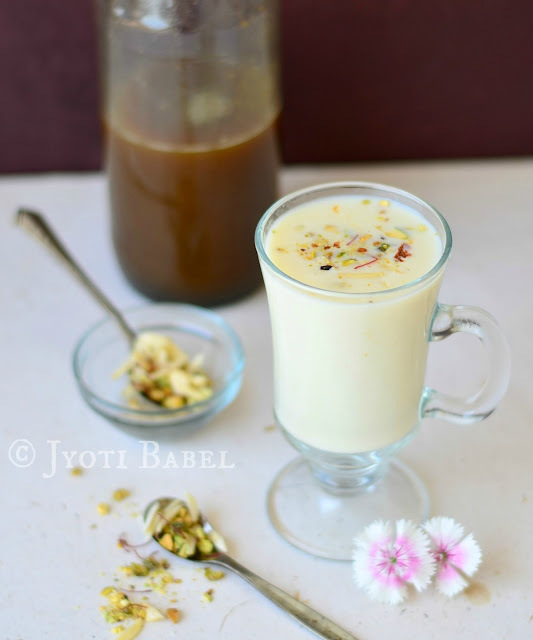 I hope you try out this recipe and enjoy a glass of chilled Thandai to beat the heat this summer. Sounds tempting... Looks yummy! Keep it up! I almost died when I had this thandai... Loved it to the core. soon gonna make it. This is what I need to make and keep to tide me over the hot and humid Mumbai summer. Ultimate, now i dont have any excuse to try this thandai syrup at home. Bookmarking. And that glass of thandai is seriously very tempting. I can feel the taste of your thandai. Super tempting. Chilled glass is perfect for this hot weather. I was looking for an authentic thandai syrup recipe, this fits the bill. The tips at the end are very helpful too. Absolutely fabulous share, Jyoti! I wish I could grab that glass right now. So nice to have the syrup on hand.I will try making it. Summer is approaching .. we can have thandai to our hearts content.. I like it with very little milk. 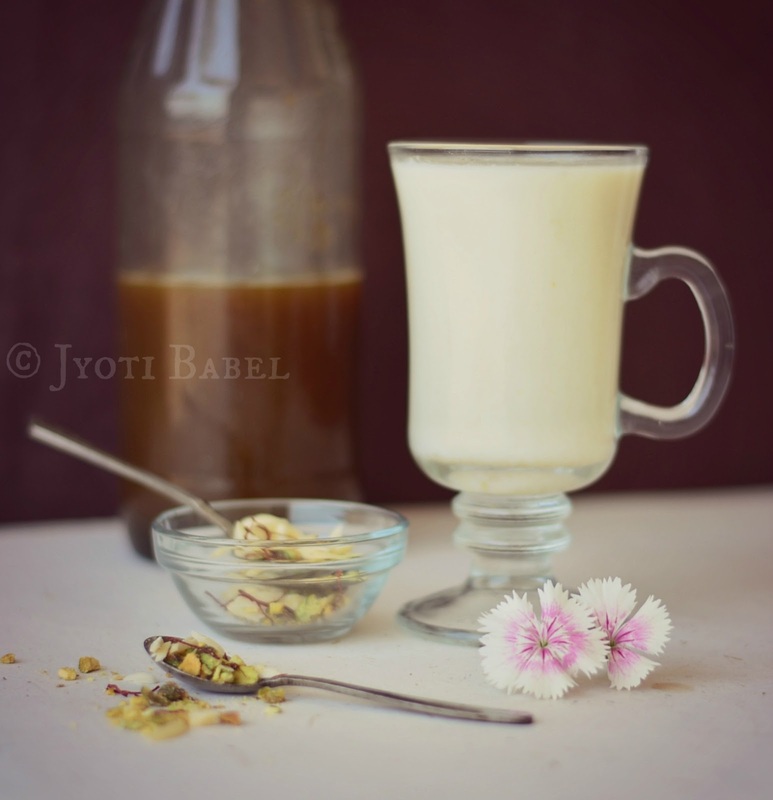 Wow, homemade thandai syrup sounds absolutely amazing. I am sure it must have tasted awesome. Sounds delicious. I will love to try making this mix. Great share. Interesting.. Loved the idea of preparing Thandai syrup to have it anytime. Very useful share ! I've always been looking for an authentic thandai recipe. A ready to use syrup would make it so much easier to enjoy this comforting drink this summer. This is so nice we can whip up thandai in just minutes with this ready to go syrup.. I have never tried thandai before althoughI have read about it in many blog posts. It sounds really delicious and I am facinated to learn how it tastes. Home made sherbets are the best! We can always add the best ingredients and control sugar levels too. Added bonus - no preservatives. Thandai is extremely cooling too for the body and hence its consumed on Holi when weather changes. Great share and lovely images. PS - I have the exact same glass too. Delicious drink.. Beautiful pictures as well.. very healthy recipe for the summer..
My favourite...very handy!! You have made the preparation look like a breeze...Yummy share!! Love this drink , so yummy and flavour ful .. I love thandai, it is a refreshing drink. This looks yummy !. Nice post. I have never used Thandai syrup myself, it's a great way to make ahead recipe for any Indian desserts. I can drink at least three glasses of thandai at once. The pictures are so beautiful Jyoti. Thats so cool. Have only had the thandai masala powder version. This is new learning.